Collaborative initiative using transit to bolster redevelopment along the Haddon Avenue corridor. On February 15, 1969, the PATCO’s High-Speed Line made its first 14-mile rail trip from Lindenwold, New Jersey to Center City in Philadelphia. At that time, more than 21,000 people rode the line each day from their homes in New Jersey to their jobs in the Philadelphia. Today, more than 32,000 people rely daily on the railway to get them to work, school, shopping and anywhere else they need to go. Because the Delaware River Port Authority conceived of the High-Speed Line as a means to get commuters to their jobs in Philadelphia, there was little attention given to the way the stations were designed to fit into their host communities. The train line runs parallel to Haddon Avenue, Camden County’s oldest shopping corridor, yet in most cases the stations are cut off from the business districts by parking lots and ill-placed entrances. This was a missed opportunity, as the train stations could have served as gateways into each town, welcoming visitors to local businesses. Camden County’s Division of Planning and the Borough of Collingswood recognized the intrinsic value of the train stations and together decided to pursue a Smart Future Grant from the NJ Department of Community Affairs to study the transit-oriented development (TOD) opportunities at four PATCO stations along the line – Ferry Avenue in Camden, Collingswood, Westmont in Haddon, and Haddonfield. TOD is a strategy whereby new development (and redevelopment) is concentrated within a five-minute walk of a fixed transit station. The idea is that filling in the area around stations with a mix of uses – apartments, shops, restaurants, services, etc. -will attract more transit riders and enhance the adjacent business district. In 2001, the project team was awarded $140,000 to complete the Haddon Avenue/PATCO High-Speed Line Corridor Study. Consulting planners Kise Straw & Kolodner convened a Study Advisory Committee consisting of representatives from the four towns, the county, and several state and regional agencies to discuss the land use issues around the train stations and in the neighboring business districts. They were also tasked with the creation of four concept plans, or TOD master plans, for each town – plus a single streetscape plan for the stretch of Haddon Avenue connecting them. The regional planning approach assured that complimentary, rather than conflicting, strategies would be utilized along the corridor. The study provides each community with conceptual site plans and renderings to help developers, public agencies and the general public understand how the public environment can be enhanced within a common, transit-oriented redevelopment model. The importance of the preservation and re-use of historic structures was noted in Collingswood and Haddonfield, which have downtown historic districts. Model ordinances and design guidelines were provided for residential and non-residential development to incorporate design features, materials and aesthetics that would encourage pedestrian-oriented environments. Conceptual designs for improved streetscapes, pedestrian crossings, traffic calming, public plazas and open spaces were also provided to each community. The concept plans for each town include mixed-use buildings and sites, combining housing, retail, office, commercial, and structured parking uses, as well as civic plazas, improved streetscapes and pedestrian amenities. The type of uses recommended were based on a variety of factors, including feedback from public participation, local land use plans, real estate market assessments, and the Port Authority’s concern that future redevelopment plans maintain at least the same number of parking stalls and help increase the number of projected commuters. Each plan creates a vision of an improved, and higher-density future with an increased diversity of uses within each of the four transit areas, and for the participating municipalities and regional and state transit and transportation agencies. Perhaps the most impressive aspect of the study is the fact that each community has begun to incorporate the recommendations into their own activities. Upon completion of the study, Haddon Township and Collingswood Borough designated the transit nodes and adjacent tracts as “areas in need of redevelopment” according to the state redevelopment statute. This designation allows the municipalities to create a redevelopment plan that supercedes the current zoning for the site. 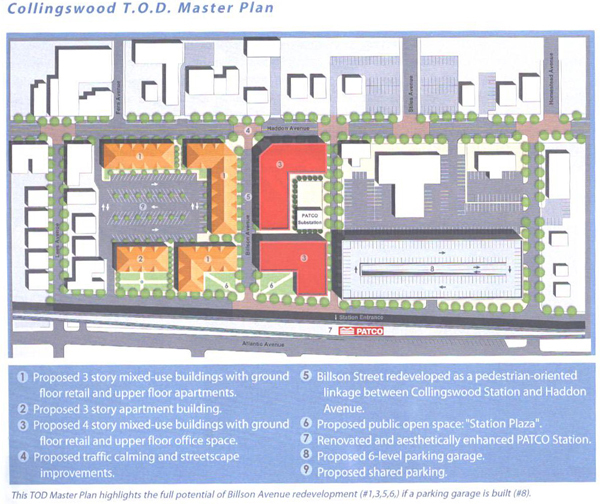 In fact, Collingswood has adopted the zoning and design guidelines from the study’s concept plan as part of its official redevelopment plan. The community has hired a firm to do a feasibility study of the redevelopment area around its PATCO station in order to identify the types of uses and businesses most suited to the site. A traffic engineer will also provide suggestions for how Collingswood can better integrate pedestrian, bicycle, bus, and auto traffic patterns. Several developers are eager to build within the redevelopment area and the town plans to issue a Request for Proposals in the near future. All of this work led to the borough’s designation as one of NJ Department of Transportation’s Transit Villages in September 2003. The Township of Haddon, in addition to designating the PATCO station area as “in need of redevelopment,” has also created a business improvement district (BID) that includes the area. The BID will enable the town to charge a special assessment on properties within the BID border for the purpose of streetscape enhancement, promotions, and the like. The City of Camden has incorporated the transit-oriented concept plan for the Ferry Avenue station as part of its own Master Plan. The Borough of Haddonfield has enlisted the Camden County Improvement Authority to draft a redevelopment plan for the train area in its downtown.